If you are taking our RemARKable Blog Tour in order, you've just come from Anne Matasci's blog Maui Stamper. Knowing Anne, she had some gorgeous artwork for you! I hope I'll continue to inspire you with ideas for the Collage Curios stamp set. 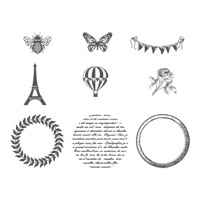 This particular set has lots of smaller images which are great for layering, collaging, creating accents or even to use on their own for a clean and simple look. All three of my projects today use the set for accents and collaging, two of my favorite things to do, so let's get started, ok? This card has a contemporary, clean feel to me. I used a color combo of Whisper White, Early Espresso and Summer Starfruit. The Sweet Floral background stamp was inked in Summer Starfruit and stamped on the middle Whisper White layer and that image alone really says contemporary to me with this design. I layered a strip of Champagne Glimmer Paper under the focal image for a unique contrast. I think it's so cool that the Collage Curios stamp set has a mini Eiffel Tower in it - perfect for pairing with the Artistic Etchings stamp set! So, that's what I did. 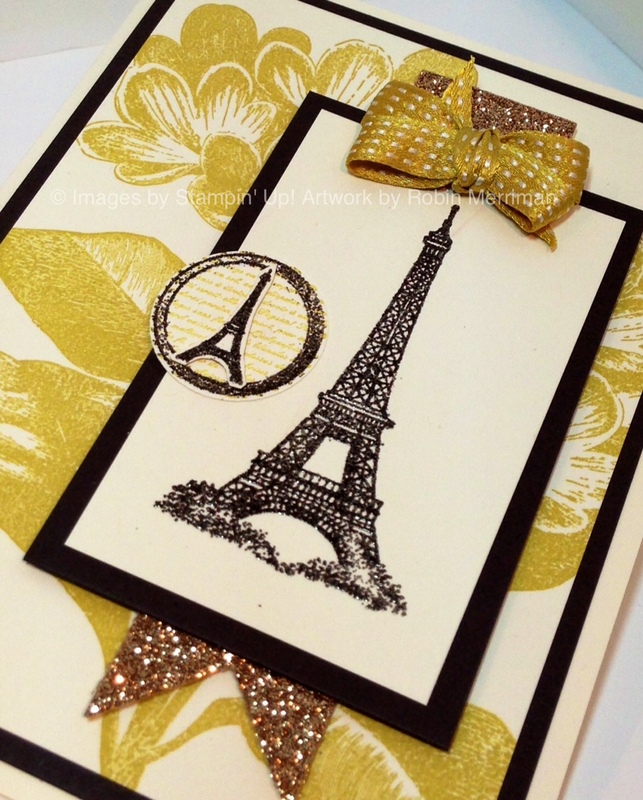 I stamped the large Eiffel Tower from Artistic Etchings in Versamark on Whisper White, then heat embossed it with a mixture of Early Espresso and Pewter powders. That gives it a cool rustic metallic finish - kind of hard to see in the photos. 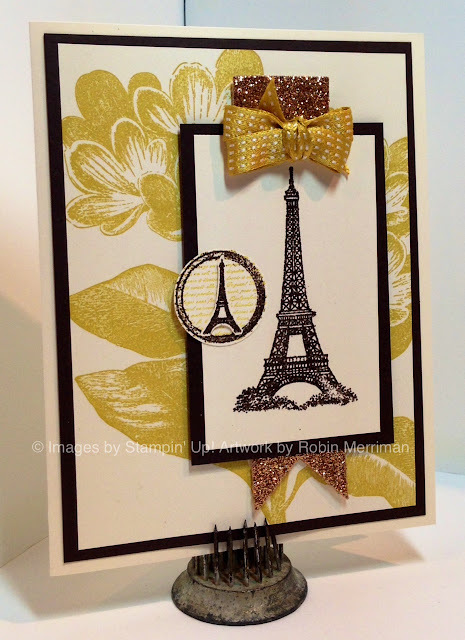 I stamped the mini Eiffel on a scrap and heat embossed it the same way then trimmed it out with my Paper Snips. The little label it's mounted on is two more of the images from Collage Curios - the word circle and the tag rim. 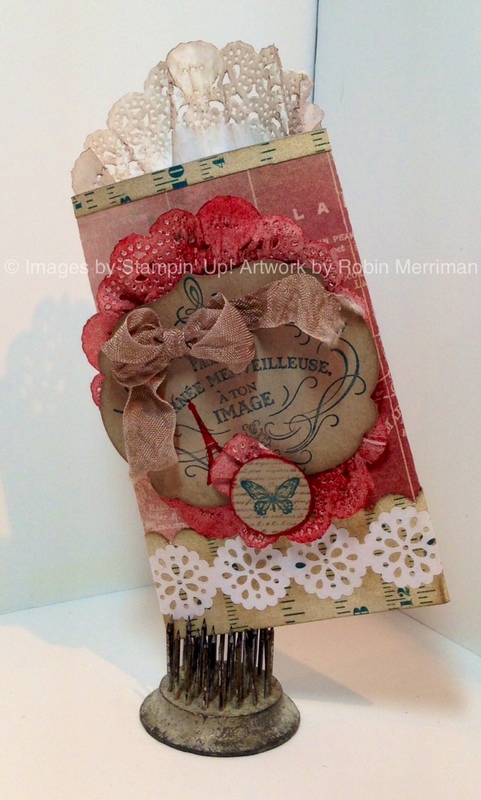 I stamped the words first on a white scrap in Summer Starfruit, then stamped over it with the tag rim in Versamark. 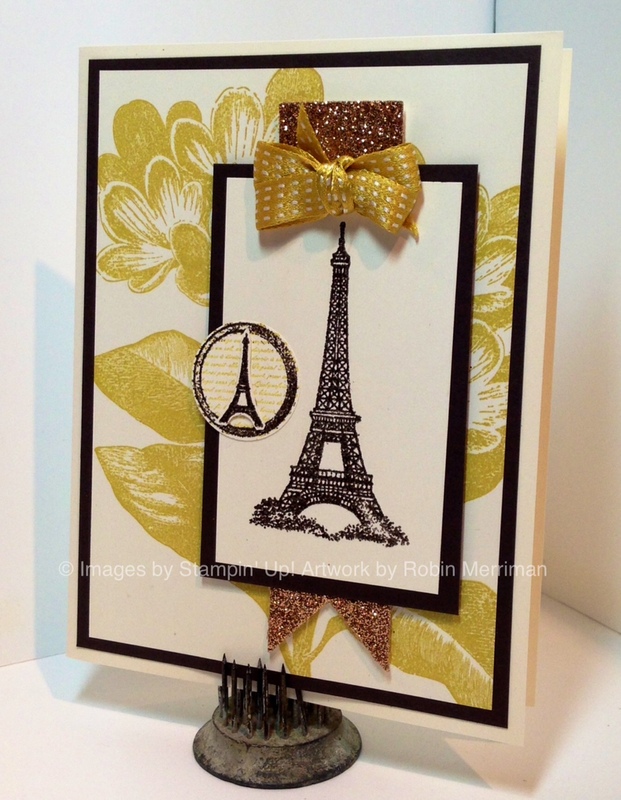 it was heat embossed to match the Eiffel Towers. After punching it out with my 1" Circle Punch, I mounted it on the focal layer as a sweet accent. The finishing touch was the double satin bow that I made with the Summer Starfruit Stitched Ribbon. 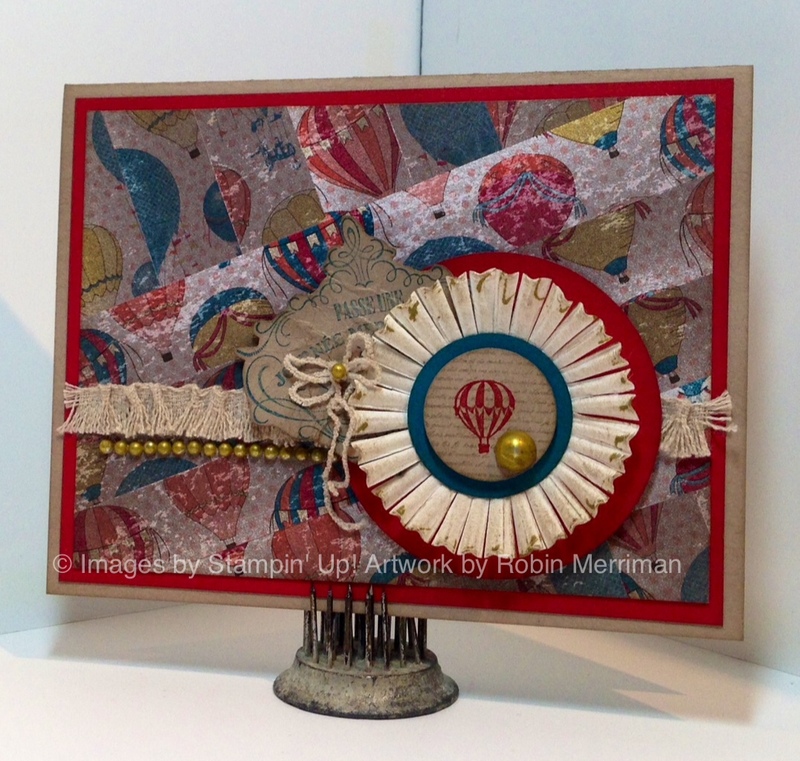 My next card actually started with a scrap piece from my Serendipity pile. That's a pile of extra pieces that either didn't work as I'd intended them or were otherwise just too pretty to simply toss. They get saved for project starters and fresh ideas. 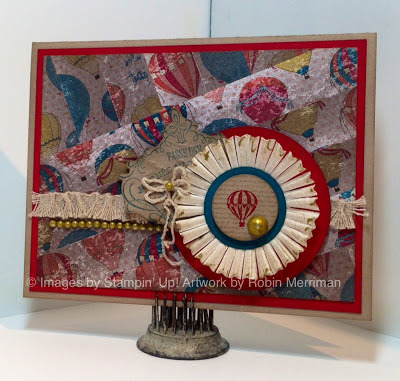 The paper pieced background layer was the Serendipity piece here. I'd had a lot of skinny strips of Fan Fair Designer Paper left over from a project, so I used them to create this paper mosaic background. They are just glued down to a cardstock base with Tombow then I trimmed the edges with Paper Snips. That layer is on a piece of Riding Hood Red cardstock which is mounted to a Crumb Cake card base. There's a lot going on in the focal point so I'll start from the top. 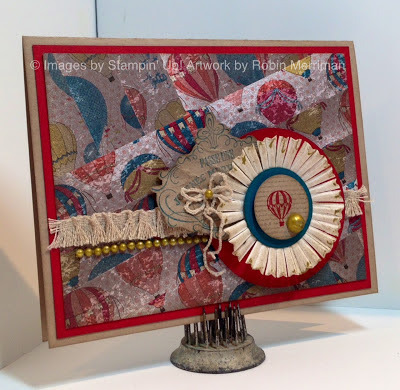 I stamped the word circle from Collage Curios with Crumb Cake ink on Crumb Cake cardstock. 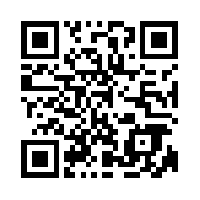 It's overstamped with the little hot air balloon image in Riding Hood Red. I thought it was so cool how that went perfectly with the Fan Fair paper I'd used on the background. Again - great co-ordination! Such a versatile stamp set! I added a Large Pearl that I'd colored with the Gold Marker and dried with the Heat Tool. The whole layer is mounted on a 1 1/4" circle from that punch in Island Indigo. 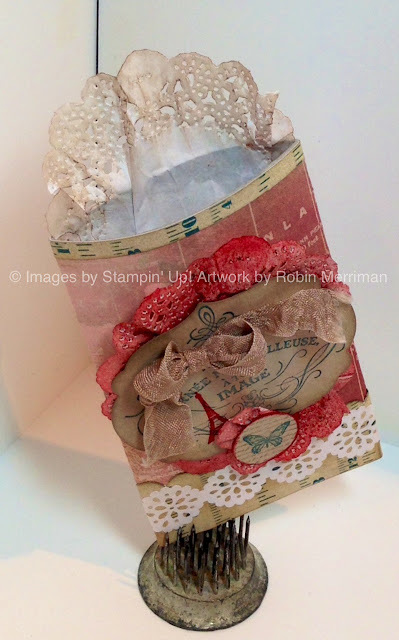 The next layer is a small cupcake liner piece from the Pop-Up Posies Kit in the Spring Mini. I've yet to use that kit for what it's intended and I've gone through 3 of them! LOL! Here, I trimmed in between each ridge with my Paper Snips then after sponging it, I flicked my Gold Marker over some of the fringe. Just a little something different. That piece is adhered to a 2 1/2" Circle punched from Riding Hood Red cardstock. The label is kinda neat. It's stamped in Island Indigo on Crumb Cake cardstock then trimmed out with my Paper Snips, then crumpled like crazy. I smoothed it out and just adhered it between the layers on the focal point. 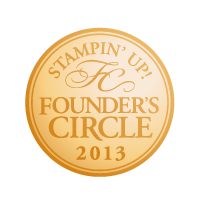 Do you recognize the stamp? Ha! 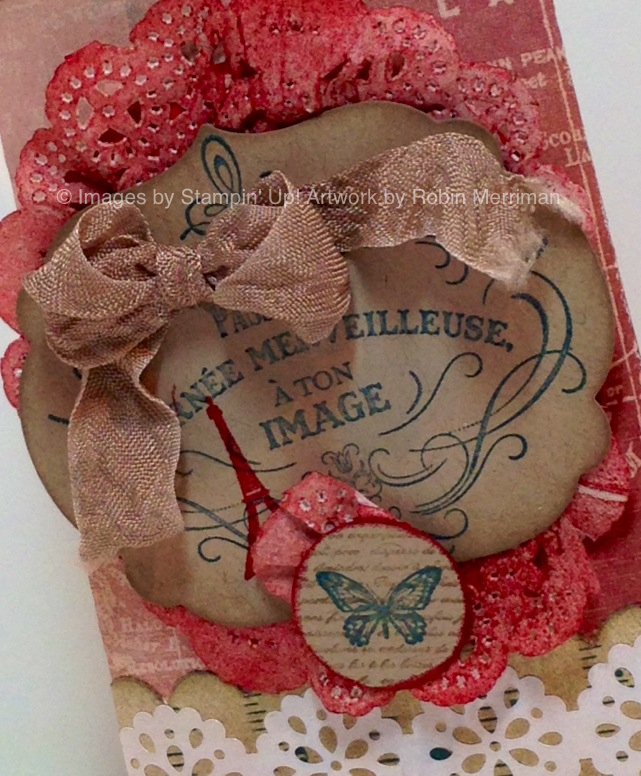 It's Vintage Verses from the Sale-A-Bration FREE offerings, but I ordered it in French! Perfect for making vintagey and antiqued artwork. Plus, I can give it to Emma's French teacher when I'm done with it! Ok, so now lets talk about the ribbon and the bow. I used a piece of the Natural Trim Ribbon from the Spring Mini. With my Ribbon Scissors, I carefully cut off one edge of the ribbon and set it aside. Several of the pieces of woven threads were removed to create the fringe then I hand pleated it across a piece of Sticky Strip on the card front. Don't make that face - it's really easy! I used the edge that I'd trimmed off to make a tiny bow and adhered it to the label with a Glue Dot. A little gold colored pearl was adhered the the bow center and I put a short row of gold colored pearls right below the fringe ribbon. I was having so much fun pairing the Fan Fair Paper with some of these elements, I thought I'd make something whimsical. It's a little gift pouch - can you guess what it's made out of?? No? Well, you know what they say, one person's trash is another one's treasure. It's a toilet paper cardboard tube! Yep, I used Multi-Purpose Glue to glue one end together flat then I took a piece of 6" x 4" Fan Fair paper and glued it around the tube. I took a strip of the ruler paper from Fan Fair and punched a Scallop Border along one side and adhered it around the bottom. 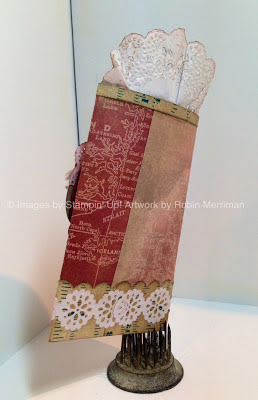 It's layered up with a piece of the Lace Tape from the Spring Mini catalog. There was a tiny strip of the Fan Fair paper left from punching the border, so I glued it around the top edge of the tube to finish it up. The doily is just a half piece that's been crumpled and sponged then glued to the inside back of the tube. You can see it better in the next photo. So for my focal image here, I stamped the same French label stamp in Island Indigo on Crumb Cake then used my Labels Framelits to cut it out. Next I stamped a mini Eiffel Tower in Riding Hood Red over top of the label. The bow is a piece of Crumb Cake Seam Binding that I wet down and then crumpled up, drying it with the heat tool. It's tied in a double bow and adhered to the label with a Glue Dot or two. Going back to my trusty word circle stamp, I stamped it in Crumb Cake on Crumb Cake, then stamped the little butterfly in Island Indigo on top. After punching it out with my 1" Circle Punch, I edged it with Riding Hood Red before adding a little piece of doily that had torn off the one I made for behind the label. Didn't want to just toss it out! The doily was easy to color, I just rolled Riding Hood Red ink over it with my Brayer then dried it with the Heat Tool. 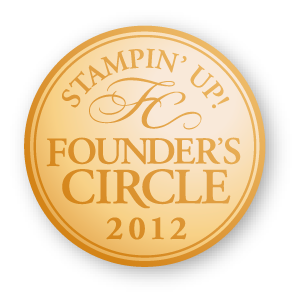 I just crumpled it up with my fingers and glued it to the back of the label before I mounted it on the tube with Stampin' Dimensionals. I really think the beauty of the Collage Curios stamp set lies in it's super versatile coordination with so many of our other products! It was SO easy to create my projects because of all the different things I had to work with that just fit it like a hand in a glove. It's a great selection of images and if I can make one recommendation to you - when you add this to your collection, be sure to purchase it in Wood Mount. Two reasons - first, the images are small and much easier to work with when they are permanently mounted on a wood block. Second, they are all about the same size, so it's much easier for them to have their own block that to try sharing one or two acrylic blocks between the 9 images. That's my rule for all stamp sets like this one and it works out great! 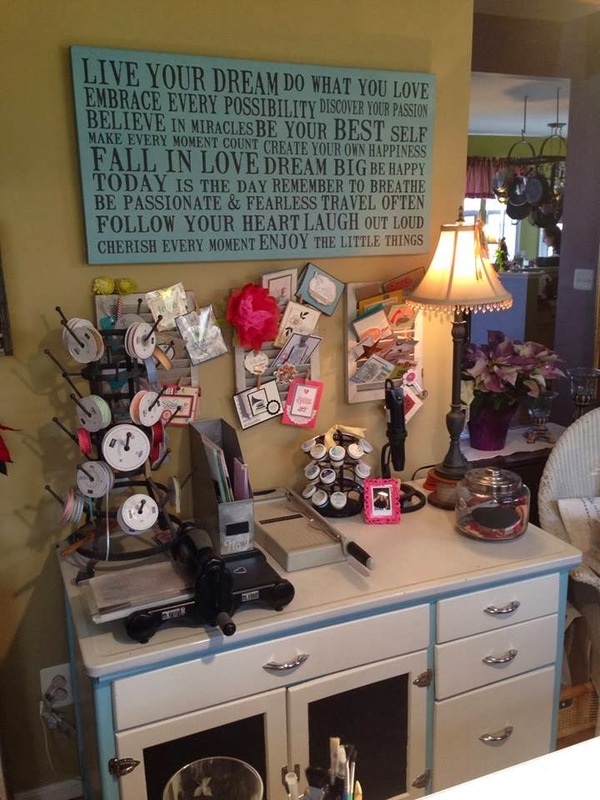 So, thanks for stopping by today - your next stop is my friend Maria Pane at Stamp and Scrap with RiRi. LOVE, LOVE, LOVE these projoects! I think there will be some serious CASE action going on here today! Thanks so much for sharing!! Fantastic projects! They're all so different. Great work! SA-weet! These are gorgeous GF, you've been busy! 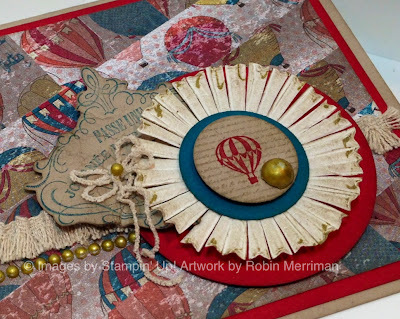 I especially like the big focal point on the collage curios project. They are all gorgeous. Great work! 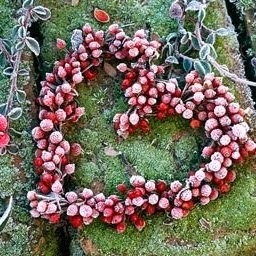 Love these Robin! ESP the Eiffel Tower! Love them all, but especially the hot air balloon card. I love the way you used the Pop Up Posie flower! Very clever.